The dropped / stalled / abandoned projects of Mammootty include Dawood Ibrahim, Vamsam and Civilian (all three supposed to be directed by Joshiy), Kayal Samrattu (in which he was supposed to play a triple role directed by Suresh Babu), Thamburan (a Lohithadas- Hariharan movie) and Siddhartha (directed by Bhadran – a movie set in Kashmir with a military background ) etc. During the last 15 years or so – many a Mammootty – Shaji Kailas project were announced but dropped. They include Paramadhikaram ( focussing on Advocate Nandagopala Marar – the cameo Mammootty did in Narasimham ); Brand Brahmanand, Shadows, Son of India, Colonel and Iritty Vavachan. Mammootty had in fact given date for another project called Kshatriya – a story about an underworld don to Shaji Kailas – but during its early stages itself the script was revamped and a new project took its place – which became the mega hit The King , released in 1995. Though Mammootty’s screen potential was used to the maximum by MT Vasudevan Nair – two projects of this team did not materialise – the most important being Thalakkal Chandu. In fact, M.T. Vasudevan Nair and Hariharan had initially decided to make a film about Thalakkal Chandu – but as the project evolved, the focus shifted to Pazhassi Raja , and the role of Chandu became secondary, going to Manoj K. Jayan. In fact, Mammootty’s first movie as a hero – Devalokam (1979) also was relegated to the cans. Based on a story by novelist Cherukad and directed by M.T. Vasudevan Nair – Mammootty was to play a character called Papppachan. Director Renjth’s projects with Mammootty that did not materialise include Raavu Mayunnu and Maram Peyyumbol. Shyama Prasad had announced Prajapathi based on the story “Anchu cent” by Malayattoor. Sadly these projects did not materialise. However, some of the titles (Siddhartha and Prajapathi) were subsequently used for some masala potboilers of the star. Other dropped projects of the superstar includes Shraddanjali (dir. Priyadarshan), Salam Fort Kochi (dir. Lal Jose – wherein Mammootty was supposed to portray a mobile court judge), Ayurekha (dir. Dennis Joseph- based on the movie The Fugitive – which later became the Mohanlal-starrer Nirnayam), Rakthachandanam (dir. I.V. Sasi), Bali Sugreeva Yuddham ( planned by Balachandra Menon with Mammootty and Jayaram), Gurudev (dir. Jomon) Kaduvakkunnil Kavarachan (dir. Renji Paniker), and Theruvu (dir. Sathyan Anthikkadu based on a story by Sreenivasan). And for trivia lovers – there is one Hindi film of Mammootty’s – Ek Din Anjane Mein (dir. Bappaditya Roy) still languishing in the cans. The movie, based on Tarashankar Bandhopadhyay’s Bengali novel Bicharak, had Mammootty essaying the central character of a judge who has to make a very consequential judgment. The project was dropped midway. Several sequel projects were also announced with the megastar in mind. Some of it happened- some did not. The movies that did not happen include Black Investigators: CBI Part V, Mathilukalkkapuuram (sequel to Adoor Gopalakrishnan’s Mathilukal with Nayanthara – directed by Prasad), the sequel to New Delhi etc. Mohanlal too isn’t far behind behind as far as dropped projects are concerned. And one of his major movies that has been relegated to the cans though more than 90% of the shoot is over is Swapnamalika (dir. K.B. Devaraj). Even the trailers were released – and the highlight of the movie was that the story was one written by the versatile actor himself. Mohanlal portrayed Dr. Appu Nair, an oncologist, who comes to Varanasi to do the last rites of his father. He comes in contact with an American woman Radha Karmel- and invites her to his ancestral house. But a bomb blast happens and the whereabouts of Appu Nair is not known. Radha goes alone to Appu Nair’s family house. The movie was supposed to be suspenseful dramatic family thriller. For all of you who have watched the movie Butterflies (1993) directed by Rajeev Anchal , you would recall Mohanlal in an orange auto racing suit, and also shots of him behind the wheel in the opening title credits. These shots were originally taken for Anchal’s another movie Australia (1992-93) which got shelved. Mohanlal was supposed to portray an racing driver whose face gets disfigured following a racing accident. Remya Krishnan was supposed to be the heroine. Sangeeth Sivan planned a movie with the superstar in the lead, and in fact the audio cassette had been released- with music by A.R. Rehman called Bhasuram. Likewise A. R. Rahman also scored music for another “discarded” Mohanlal project called Vaishnavar. The movie Dhanushkodi – planned right after the success of Aryan – by Priyadarshan was also dropped midway. Raghuvaran and Girija Shettar (of Vandanam fame) were supposed to share screen space with Mohanlal. Sadly this never happened. Following Sagar alias Jackie – Amal Neerad had shown interest in reviving this project – but nothing has materialised as yet. Other Priyan – Mohanlal projects which were announced but that never took off include Kunchan Nambiar, Manikkyakallu (based on a story by M.T. Vasudevan Nair), Shathabdi, Shadkala Govinda Marar, Subhadram and an untitled project featuring Mohanlal with Dulquer Salman. Swarnachamaram (dir. Rajeevnath) was an ambitious project which would have called for Mohanlal sharing screenspace with Sivaji Ganesan for the first time. The story was one concerning euthanasia. This project never materialised and the producer used the dates given by Sivaji and Lal to make Oru Yathramozhi. Three dream projects that have yet not materialised (actually which I hope these will be made sooner than later) are M.T. Vasudevan Nair – Hariharan team’s Randamoozham, Nair-San and Dasanum Vijayanum. Mohanlal is supposed to portray Bheeman in M.T. Vasudevan Nair – Hariharan team’s Randamoozham. The minute this movie was announced – Malayalam movie fans had taken ‘control’ over the casting details and had assigned the role of Karnan to Mammooty and Duryodhan to Kamal Haasan. But other than the announcement, the project appears to be in limbo ! Nair-San – an ambitious Indo- Japanese project was supposed to feature Jackie Chan and Mohanlal in lead roles- based on the story of a freedom fighter A.M.Nair and the same has not gone a step further than the announcement. For the past 15 or 20 years Dasanum Vijayanum had been in the making – the 4th part to Nadodikattu. Roshan Andrews, Priyadarshan and Rafi Mecartin’s name had been associated with its making. Following the success of Sphadikam, (interestingly Sphadikam also spent some time in the cans before being released) Bhadran had planned two movies – Swarnam and Sauparnikam. Swarnam had the superstar acting in a dual role. The movie was scrapped and in its place came the dud Udayon. Sauparnikam was another Bhadran- Mohanlal movie which was since scrapped. 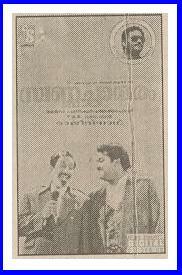 Anil’s Brahmadathan (audio cassette released), Lal Jose’s Cousins ( in which Mohanlal was to share screenspace with Prithviraj), Shajoon Kariyal’s Talkies (Mohanlal portrays a double role of father and son – who finds it hard to run a cinema in a village) and Raman Police; Joshiy’s Maharshi Mathews, Che Guvera, and Karnan, Shaji N. Karun’s Kadal, Sarath’s Krishna; Renjith’s Vargam and Zachariya Pothen Jeevichiruppundu, Johnny Antony’s Kudumba Chitram and Ettam Claasum Gusthiyuim; Jayaraj’s Mazha, Kamal’s Avasthantharangal, Fazil’s Dulari Harshan (in which Mohanlal and Sreedevi were to be paired), Shaji Kailas’s three movies- Daveedu Rajavu (in which Mohanlal was to play a character called Isahak Pothen); Spirit (a fight against the liquor mafia), Emperor – all failed to make it to the floors. Lohithadas had initially planned a movie called Bheeshmar with Mohanlal – it didn’t happen and later started a project which starred Mohanlal and Dileep. The movie was called Chakram and it was to be the debut of Vidya Balan in Malayalam. The same did not happen and later Lohithadas adapted the same story starring Prithviraj and ‘Noolunda’ Vijesh. G.S. Vijayan famed for Aanaval Mothiram (based on the Hollywood movie Short Time); Charithram (re-make of Chase a Crooked Shadow) planned a movie with Mohanlal in the lead titled Chodyam. This was based on the play ‘The Unexpected Guest’ by Agatha Christie and Rahman was to act alongside Mohanlal. This also never got completed. Several sequel projects were also announced with the legendary star. The sequels that did not happen include Yodha, Nokkathadoorathu Kannumnattu (Return of Dolly) ; a sequel to No. 20 Madras Mail (floated by actor Ashokan), Garudapuranam – a sequel to Sreekrishna Parunthu ( by Anoop Menon ). Likewise several projects had been announced featuring the superstar duo – Mammooty and Mohanlal. Arakkallan Mukkalkkallan, announced in the late Nineties, kept doing the rounds even till 2011. Hello Mayavi (with the characters portrayed by Mohanlal in Hello and that of Mammootty in Mayavi coming together) is still in the news. There was also another movie called Ceaser (supposed to be directed by Hariharan) that seems to have never got beyond the paperwork. But the best project that ought to have happened was K.G. George’s magnum opus Kamamohitham, based on the story by CV Balakrishnan. Mohanlal was supposed to portray Sargadathan and Mammootty – Jajali Maharshi. Both had given their consent, but the project did not materialize. If it had happened, it would sure have become another feather in the ace director’s cap. Next : Of Suresh Gopi, Mukesh, Jayaram, Dileep, Prithviraj et al. Aap ki Kasam is based on the malayalam movie Vaazhvemayam and not vice versa i believe. The release dates of these films substantiate.. agree? Congrats for the painstaking effort in unraveling the attempts made by our film makers but failed due to various reasons. The second part is more detailed and the list is very long when compared to the first part. How you managed to collate this information? Great effort. Kindly recall my suggestion to your first part in this matter. The old song books per se will give you information on the films announced but never appeared in the early era. My submission to you is to publish these three parts in a book which will be useful for the future researcher on Malayalam movies.